Are you ready for Spring Cleaning? Call me crazy, but I love spring cleaning. I love going through the house, top to bottom, making sure I clean all the nooks and crannies. 😉 I know spring cleaning can be daunting, even for the most seasoned housekeeper. Where do I start spring cleaning? To keep me organized and on track, I like to use a spring cleaning checklist. Using a checklist not only keeps you on track, but also makes sure you remember to clean even the smallest things in every room – like wiping down the baseboards. I don’t know why, but I tend to leave this chore until the end. 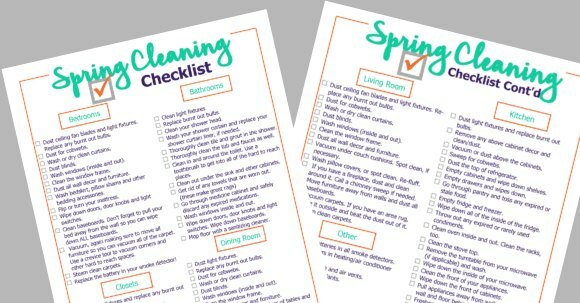 What is spring cleaning checklist? If I didn’t use a spring cleaning checklist I know I’d probably forget a lot of tasks. This list will keep you organized room by room. Are you ready to start your spring cleaning list? From the living room to the bedrooms and more, this cleaning checklist will have you deep clean all the areas from top to bottom. This is the ultimate spring cleaning tips that will have everything from the ceiling fan to the baseboards clean and shiny. Grab some all purpose cleaners and tackle this house spring cleaning checklist. 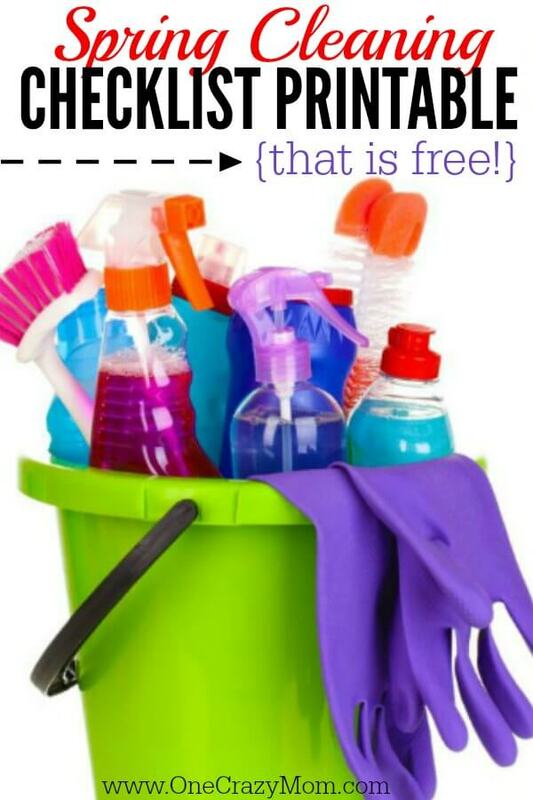 It is so helpful to have this printable house cleaning checklist! Dust ceiling fan blades and light fixtures. Wash or dry clean curtains. Wash windows (inside and out). Also open windows and clean the window frame. Dust all wall decor and furniture. Wash bed skirt, pillow shams and other bedding accessories that may not get washed on a regular basis. Flip or turn your mattress, too. Wipe down doors, door knobs and light switches. Clean baseboards. Don’t forget to pull your bed away from the wall so you can wipe down ALL baseboards. Vacuum, again making sure to move all furniture so you can vacuum all of the carpet. Use a crevice tool to vacuum corners and other hard to reach spaces. Replace the battery in your smoke detector! Dust light fixtures and replace any burnt out bulbs. Go through your clothes. Be honest. Donate items that don’t fit or that you no longer wear. Empty drawers, dust them and refold clothes. Dust any shelves or furniture. Clean light fixtures. Replace burnt out bulbs. Wash your shower curtain and replace your shower curtain liner, if needed. Thoroughly clean tile and grout in the shower. Thoroughly clean the tub and faucet as well. Clean in and around the toilet. Use a toothbrush to get into all of the hard to reach places. Clean out under the sink and other cabinets. Get rid of any towels that are worn out (these make great rags). Go through medicine cabinet and safely discard any expired medications. Mop floor with a sanitizing cleaner. Vacuum under couch cushions. Spot clean, if necessary. Wash pillow covers, or spot clean. Re-fluff pillows. If you have a fireplace, dust and clean around it. Call a chimney sweep if needed. Move furniture away from walls and dust all baseboards. Vacuum carpets. If you have an area rug, take it outside and beat the dust out of it. Dust an light fixtures and replace burnt out bulbs. Remove any above cabinet decor and clean/dust. Vacuum or dust above the cabinets. Dust the top of refrigerator. Empty cabinets and wipe down shelves. Empty drawers and wipes down. How do so many crumbs accumulate in the drawers?! Go through pantry and toss any expired or stale food. Empty fridge and freezer. Wipe down all of the inside of the fridge. Throw out any expired or rarely used condiments. Clean oven inside and out. Don’t forget to clean the racks, too. Remove the turntable from your microwave (if applicable) and wash. Wipe down the sinde of your microwave. Clean the front of your appliances. If you have stainless steal appliances, see the best way to clean them here. Pull appliances away from wall and clean the wall and floor behind them. Use a toothbrush to clean around the faucet. Clean the grout between your tile. Mop your floor with a sanitizing cleaner. Dust all wall decor and furniture. Make sure you wipe down legs of tables and chairs. If you have an area rug, take outside and beat the dust out. Replace filters in heating/air conditioner intakes. Dust all heating and air vents. What do you clean with spring cleaning? Do you use a checklist? I would love to hear how you tackle this task. It’s so important to get organized. Otherwise, it’s easy to feel overwhelmed. 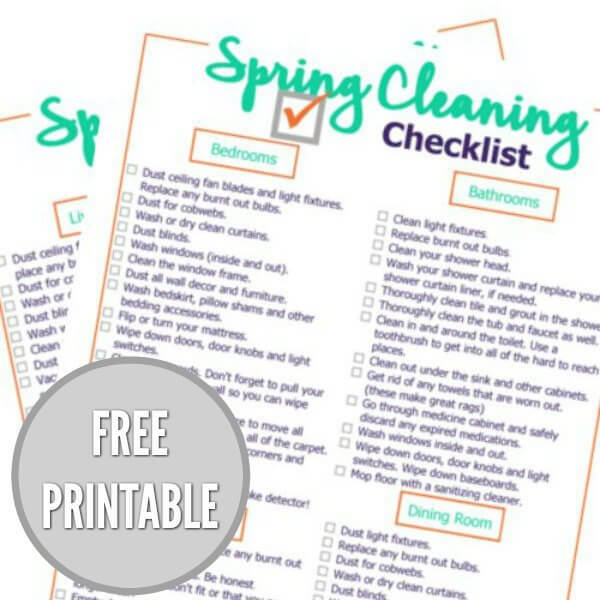 I also have a FREE Spring Cleaning Checklist Printable where you can download your own Spring Cleaning Checklist and physically check off after you have done the chore. 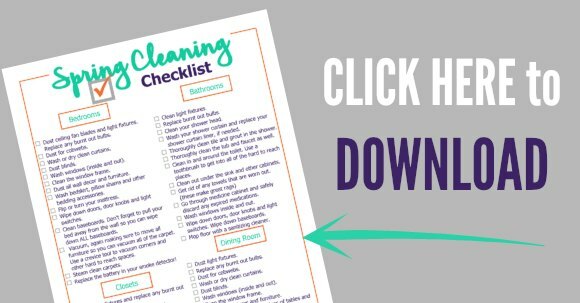 I actually just printed my free spring cleaning checklist printable and am starting today! Woohoo! This cleaning calendar will be a huge help and also the simple spring cleaning checklist. 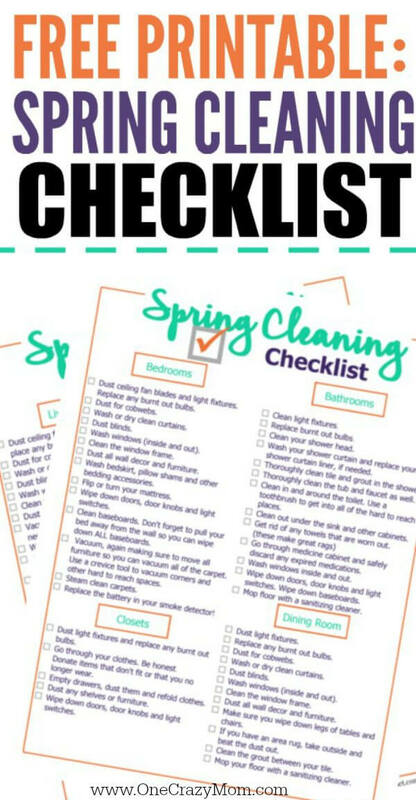 Join me in some good Spring Cleaning with this cleaning schedule checklist. You can also try using a weekly house cleaning checklist so that you will not have so much to do at once. Learn how to clean stainless steel appliances with only 2 items! It’s so easy when you know the trick!